I've never spent much time in Palo Alto. 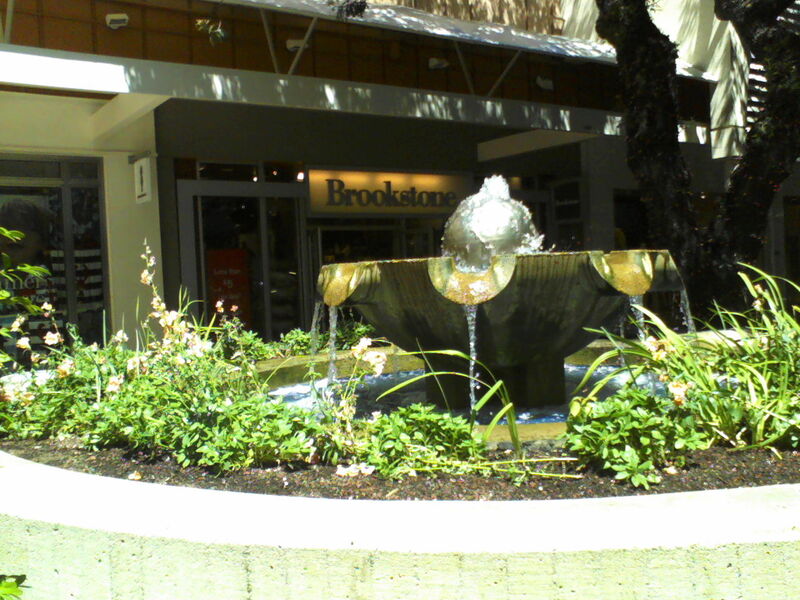 Back in my childhood when we still took long car trips during our summer vacations, Palo Alto was some place we passed through on our way to San Francisco or heading back towards Los Angeles. I can't recall even seeing their renowned Stanford University, much less explored the town itself. Last month, however, I had the opportunity to do both, during a short but intense trip up north to visit an old family friend--she and my mother have known each other for more than 50 years--who was having a celebration of her 99th birthday. And the day after that, her great-granddaughter was celebrating her 1st birthday, making for a century of living between them! So am I going to bore you with pictures of my travels? Absolutely! Although Stanford University wasn't on the sight-seeing itinerary, I managed to catch a glimpse of it and a shot of Stanford Tower as we tried to navigate the unfamiliar streets and find our way downtown. The Leaning Tower of Stanford? The angle at which I took the picture--craning out the window--gives it a tilt worthy of the Tower of Pisa, but I rather like the effect of the stone and brick spire silhouetted against the soft blue of the spring sky. We did have lovely weather during our stay. Like many college towns, Palo Alto has a casual, almost sleepy atmosphere. Tree-lined streets, small, cozy-looking shops, restaurants of all description to feed a hungry student population. Fewer bookstores than I expected, which was a surprise and a pity. One of the last remaining Borders (remade from an old movie theater) had recently closed its doors. The neon sign was still in place, but peering in through the smudged windows, I saw only crumbling plaster and emptiness. 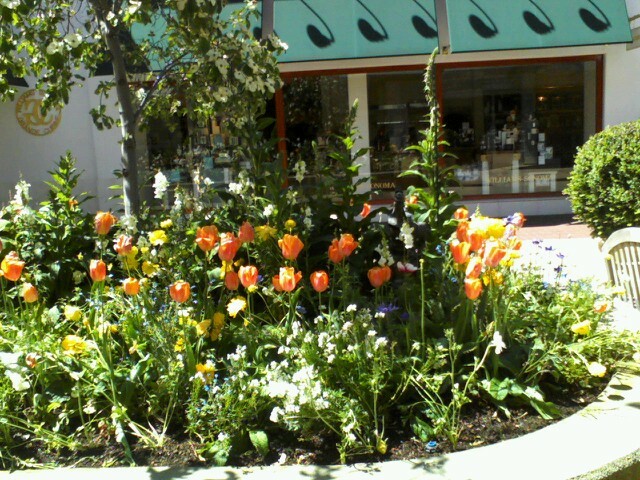 There was no bookstore at the upscale Stanford Mall, either (another disappointment), but there were several striking fountains, and garden islands brilliant with spring flowers--love those flame-colored tulips! My traveling companion wanted to be as close as possible to the restaurant where the party was being held, so after some searching, we settled at The Cardinal, a historic hotel in downtown Palo Alto that was only an eight-minute walk away. Built in 1924, the art-deco Cardinal boasted a wealth of period ambiance, which was especially visible in the lobby: tiled floors, acorn-shaped chandeliers, a Batchelder fireplace flanked by wrought-iron torchieres that hadn't been moved since the hotel opened for business almost 90 years ago, and an antique piano in one corner. Rooms were reached via an old-fashioned elevator with an outer door you had to open and close manually. Fortunately, the rooms themselves were modern enough, with up-to-date plumbing, a flatscreen TV, and wireless internet access. 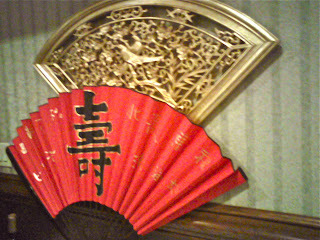 No air-conditioning, but a ceiling fan kept things pleasantly cool and made almost no sound whatsoever. 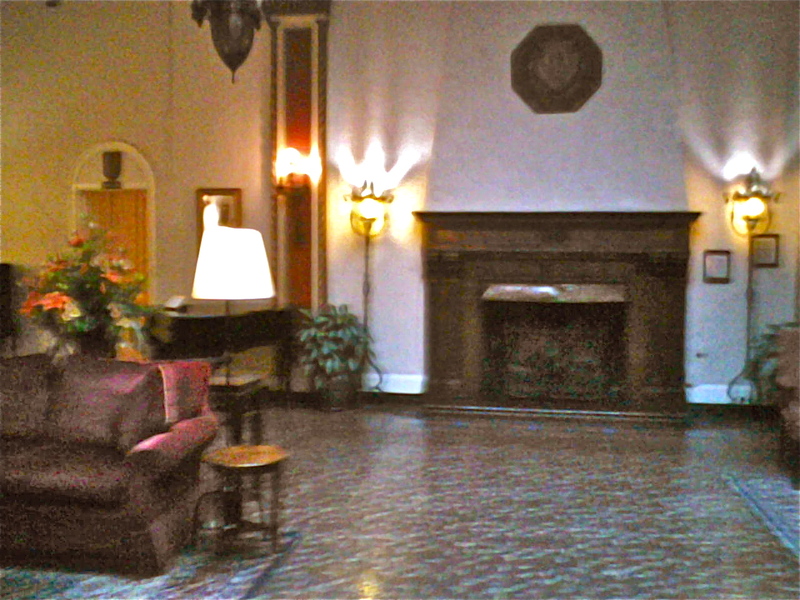 While I wouldn't have wanted to stay there indefinitely, I enjoyed our brief sojourn in an elegant, more gracious era. The crowning events of our stay were the two birthday parties, the essence of which can be summed up by the stunning Longevity fan commemorating the first honoree's rich, full life as the matriarch of a large, far-flung clan, and the Red Eggs (colored by red calligraphy paper) symbolizing the beginning of the second honoree's. Both birthday dinners were Chinese banquets--and all I'm going to say there is: if you are ever invited to one, pace yourself. The food was delicious and beautifully prepared, but the courses, they keep coming! Appetizers, soup, salad, fish, poultry, beef, pork, rice . . . although once you get to the noodle dishes (noodles for longevity), the end is usually in sight. Dessert, however, was thoroughly western birthday cake--a popular choice, since Chinese cuisine doesn't exactly excel at sweets. A lovely time was had by all: the first honoree was touched and delighted to see so many friends and relatives in attendance, while the second honoree got to do one of her favorite things ever: eat! And with a possible lifetime of Chinese banquets before her, that knack will surely stand her in good stead. Happy birthday, ladies! Thank you for inviting us--and we enjoyed celebrating these momentous occasions with you. What fun! I hear a scene from a book playing out there. And Happy Birthday to the honored guest, 99 is something to celebrate for sure. Carolyn, 99 is indeed a landmark worth celebrating--the best part is the honoree is still as sharp as a tack, and possessed all her faculties to enjoy such an occasion. Wow, very auspicious celebrations and yum, what a lovely way to celebrate these occasions. 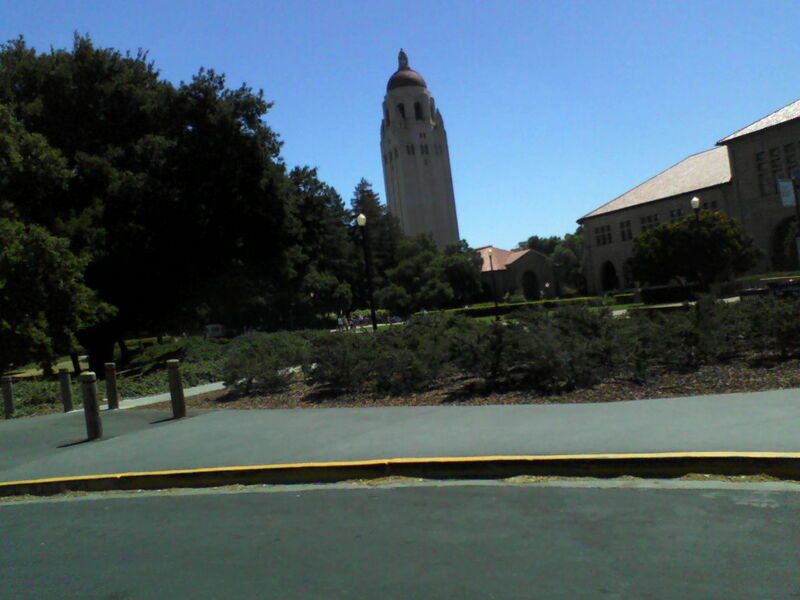 Thank you for sharing...I have never seen Stanford U either, even though I have driven up to San Francisco several times. Elf, glad you enjoyed hearing about the celebrations! 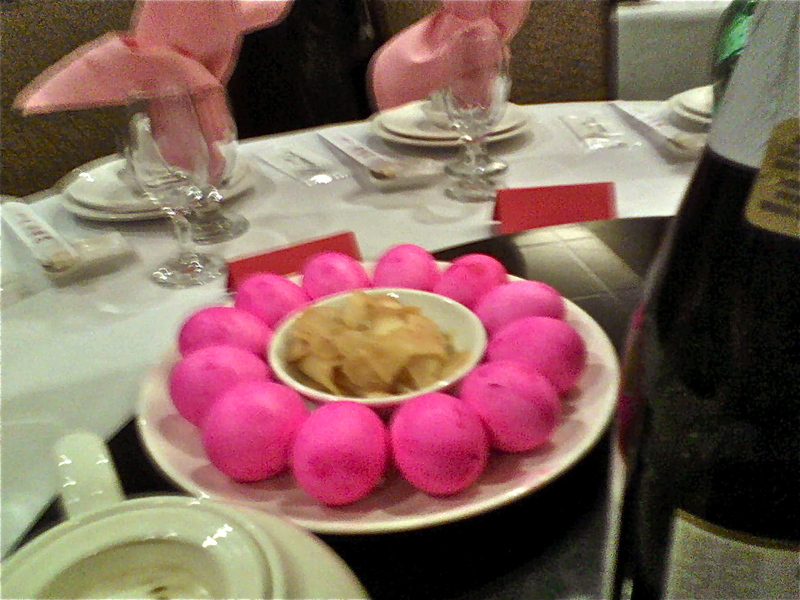 And yes, the food at both banquets was delicious--I was especially taken with the Peking duck. Someday I'd like to take a longer look at Stanford U too. Perhaps on a more leisurely trip. Wow! That place was gorgeous! And my tummy's growling at the mention of a Chinese banquet. Brooklyn Ann, Palo Alto was very pleasant, and the Cardinal Hotel picturesque. I wouldn't be at all averse to revisiting both places sometime. As for Chinese banquets, if you go to one, bring an appetite--you'll be sure to need it! Interesting trip! The banquet reminds me of the SB dinner at a Vietnamese restaurant in NYC. I thought they'd never stop feeding us! Congrats to the birthday girls! Cheryl, at least one guest murmured when still another course was brought out, "Are they done yet?" I managed by keeping my portions small to moderate and bypassing things like jellyfish (it's not the taste, it's the texture that turns me off! ).